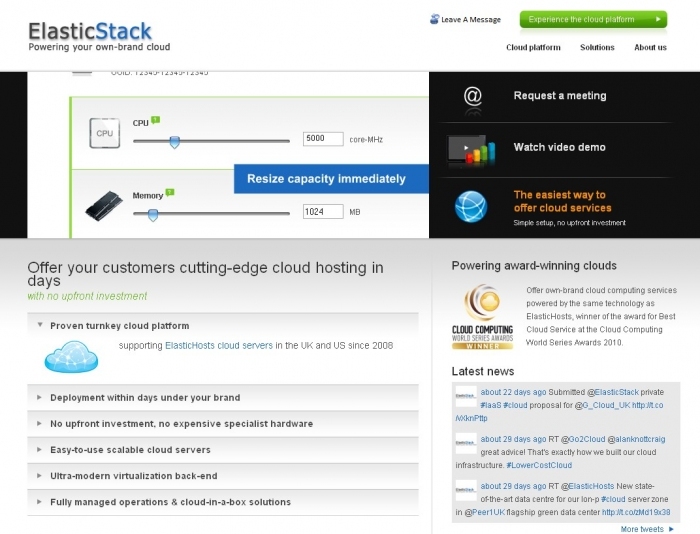 Deploy ElasticStack and offer own-brand cloud servers. Create servers instantly. Resize capacity immediately. Run any PC operating system and software. Control via the web or by API. The ElasticStack cloud platform lets you offer cloud servers to your customers supported by a proven turnkey cloud platform with quick, easy and low-cost deployment. In addition to our turnkey cloud platform itself, we can provide fully managed operations to help you launch swiftly and cloud-in-a-box solutions - specially selected, proven hardware, optimised to run ElasticStack server virtualization, and pre-installed with all the software you need. Your customers see only your branding, giving them a totally seamless experience. You sell and market your cloud servers, and provide front-line customer support. We supply documentation to make front-line support easy. We provide second-line support to your staff for any questions not answered by our documentation, as part of our fully managed operations. The ElasticStack cloud platform provides an easy-to-use web control panel with your branding, so that your customers can easily & instantly create cloud servers. ElasticStack monitors and bills your customers' use, with local payment integration. Your customers can also control their cloud services though the ElasticStack API, which offers all of the functionality of the web control panel. We provide fully managed operations for ElasticStack, including installation, updates, maintenance, 24/7 monitoring and incident remediation. Our ultra-modern virtualization backend is built on an advanced Linux KVM virtualization, supporting any OS with no special drivers. See full details of our software architecture. ElasticStack runs on commodity server hardware, with no expensive SAN/NAS required, saving you money and time to launch. See our full hardware requirements. Alternatively, you can use our pre-selected cloud-in-a-box hardware, optimised for price/performance.